High winds have created lots of snowdrifts in Iowa. More than 300 school districts across Iowa are either closed or have declared weather emergencies due to blizzard conditions. The winter storm left a deep blanket of snow and very cold temperatures. Craig Cogil, a meteorologist with the National Weather Service in Johnston, says it’s a good morning to stay home. Cogil says about a foot of snow fell in central Iowa and the winds are picking up, gusting to 60 miles an hour. Some areas are expecting 16 to 18-inches of snow by the time the flakes stop flying later today. Cogil says all of Iowa’s 99 counties are under a Blizzard Warning as the heavy snow, high winds and harsh temperatures are combining for a very severe weather event. 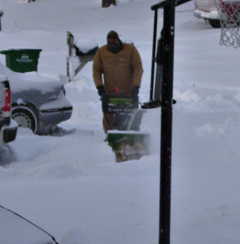 Some Iowans are braving the winds trying to dig out. The Blizzard Warning will run until 6 PM for most parts of the state, with winds continuing at 25 to 35 miles an hour with gusts up to 50 miles an hour. 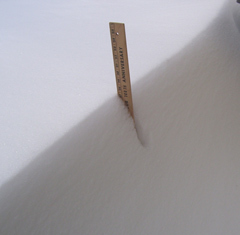 Those winds have the potential to create drifts eight to 15 feet high. Wind chill advisories are also in place as the winds are making it feel like 20-below zero in some parts of Iowa. For the latest road conditions and closures, call 5-1-1 or visit IowaRoadConditions.com. Iowa motorists who are braving the elements during this blizzard are finding very difficult driving conditions. Andy Buffington is the emergency management coordinator for Winnebago and Hancock counties in northern Iowa. Buffington says it’s a good day to stay inside. “Road conditions are absolutely treacherous right now,” he says. “Travel is 100% not advised. The majority of areas are zero visibility and I literally had to drive with a window open so I could see where the ditch was at.” Buffington says the strong winds are whipping up huge snowdrifts and the going is very slow. He’s telling everyone to stay put. “It’s an extremely dangerous situation for the traveling public,” he says. “I can’t stress enough the importance that the only time today that it would be necessary to travel while the blizzard is in effect would be if it’s a matter of life and limb.” Buffington says unless there’s a serious medical issue, don’t leave your home. “You need to make arrangements with your employer, if you have appointments, things like that, so that you don’t get yourself out there,” he says. “If you would get stranded, we have to send — we’d try to send somebody out to assist you but between the time that help can arrive and the time that you’re sitting there, another vehicle could come along and strike a stalled vehicle.” The Radio Iowa affiliate reporter who sent us this story got to work this morning via snowmobile.